The ‘Add Recess’ tool is available for rooms that have been closed/ended. It allows the measurement of complicated shaped rooms to be simplified although there will be instances when it is best to use a total station or measure with a DISTO and adjust or manually enter irregular angles, as the recess tool is specifically for symmetrical additions either into the room such as a chimney breast or column or out of the room such as a chamfered Victorian bay window. 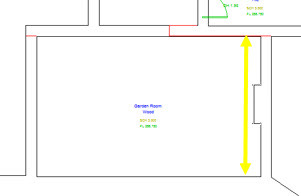 When measuring a room with external recesses, measure along the main line of the wall, before ending the room, adjusting if required and adding the recess. Any room adjustments should be made prior to adding the recess. When measuring a room with internal recesses, measure the main line of the wall past the recess (into the room), before ending the room and adding the recess. Work as close to the recess as you can. 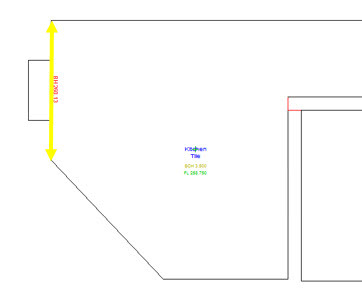 Before starting to add an internal recess you can either assume it is square to the wall it is being added to or if it is obviously not square you can calculate the L (Length) of the recess, by subtracting the measured values either side of the recess from the entire length of the wall. To use the recess tool the recess must be symmetrical and the L (length) of the recess must be equal to or greater than IL (Internal Length) of the recess, if either of these or both of them DO NOT apply measure the room fully, including the recess and adjust or use manual angle entry. Refer to Lesson 2 for information on how to measure an irregular shaped room. The recess will be added to the currently selected layer and the walls of the recess take on the same properties as the walls of the room and symbols can be added to these walls. Any further edits required to the recess can be made via the Delete Vertex tool in the Room Adjustment tools.